A great guitar at a great price. Who could argue with that? A Brexit-beating price; great build and sounds; nice cost-saving satin finish. There are limited colours and no options available. The CE 24 Satin Ltd, which lists at £1,999 (including gigbag), features a maple top, but also uses the more cost-effective satin finish and is offered in three colourful hues: Faded Grey Purpleburst, Faded Grey Blueburst and Faded Grey Cherryburst. Irrespective of the price, there's plenty to like here. Finish aside, it's identical to the gloss-finished CE 24, which sits between the Core and the (more cost-effective but still USA-made) S2 guitars in terms of construction and specification. 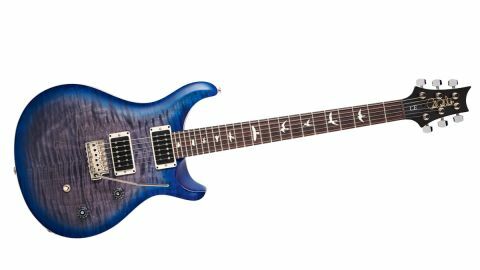 One obvious difference here is the slab-sawn S2-style three-piece neck, which, typically on PRS's bolt-ons - and in Fender-style - is natural. Here, it's black for no other reason than PRS Europe's MD, Gavin Mortimer, thought it looked cool! And why not? The S2-level, nickel-plated hardware is designed in the USA and made in Korea, the exception being the unplated brass-coloured tuner shafts and that raised gold-coloured Paul Reed Smith script logo, which eagled-eyes readers will notice is (yet) another version of the main man's signature and different from the CE 24 we looked at in issue 403. Aside from those differences, it's the same guitar: original- outline thin-depth body (44mm); one-piece mahogany back with centre-joined figured maple top with its slightly flatter top carve; S2 pattern thin-neck profile; and old-style block bird inlays. Unlike the S2-level guitars, however, the CEs use the USA-made 85/15 uncovered humbuckers with their rectangular bobbins controlled by a three-way toggle with master volume and tone -the latter with a pull/push switch to engage the partial coil- spits for more single coil-like voices. The Ltd's maple top is smooth to the touch. As ever, a satin finish will burnish to a low gloss with use, but is more susceptible to marking. If you like your guitars not only shiny but mark-free, this probably isn't the finish for you. It has a working-guitar look and feel about it, too, unlike the "OMG, don't touch that!" vibe of many of PRS's upper-level instruments. The satin neck back feels different to a gloss; the Ltd's is not as silky smooth as a gloss or indeed the recently-released Standard. Scale length is standard PRS 635mm (25 inches) and the 'board has a 254mm (10-inch) radius, and while the profile does feel a little skinny if you're a Wide Fat player, it's very mainstream and feels really good. Intonation is as slick as ever with easy playability - few players will object. The McCarty seems more 'dinner suit' jazz and blues; the CEs have got tighter jeans and longer hair! With only the 13mm slice of maple differentiating the Ltd and Standard models, we'd expect them to sound close, and while they both share a zingy acoustic response, the differences emerge when plugged in. They obviously sound very similar, but there's definitely a rounder, woodier, slightly chunkier voice to the Standard that seems to tame the almost over-crisp highs of the Ltd a little and pushes the 'bolt-on' sound to the fore. The Ltd lacks the depth of our reference 2016 McCarty; instead the new CEs sound crisper and rawer. The McCarty sounds like an older, plummier 'Gibson' compared with these new CE models' more hot-rod 'Fender' voice. The McCarty seems more stately, more 'dinner suit' jazz and blues; the CEs have got tighter jeans and longer hair! The CE 24 Satin Ltd looks and sounds like what the original CE became: a bolt-on version of the Custom, albeit with the newer acoustically enhanced PRS voice and the very open, classic-sounding but not midrange-heavy 85/15 humbuckers. And at this price, we should note that there's nothing wrong with that, not least that it's relatively collectible, too.